As discussed above, you should seek to use the smallest EE which give you all the features you require. Practically speaking, when creating a new OSGi bundle J2SE-1.8 is a reasonable starting point. Given that this version is currently actively maintained by Oracle (see Java support by Oracle) and the pervasive use of generics in both the OSGi framework and other libraries, lower EE settings are only practical in very specialized applications. If your particular bundle requires capabilities from a later EE, then specify a higher EE, but keep in mind this may limit adoption of your bundle for applications using an older Java runtime. Projects should not leave these choices to chance. Dependency structures are key parts of an architecture. 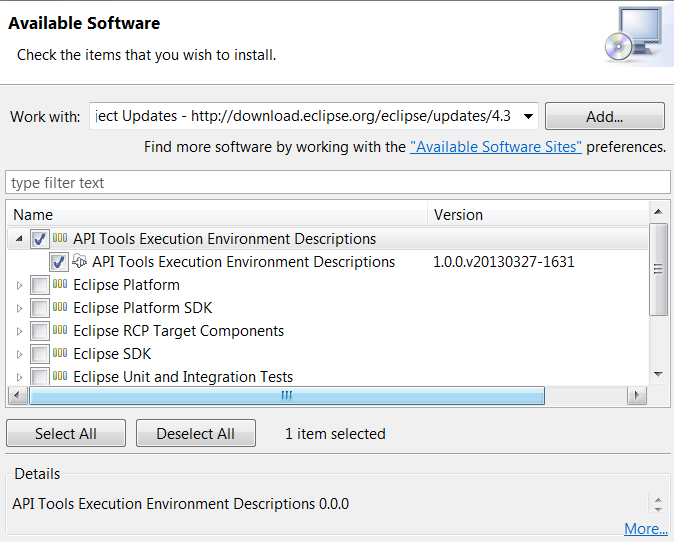 For example, the Eclipse Project has explicitly identified EEs for all of their bundles. These choices are documented in the project plan. The execution environment listed in the table is based on the needs of the bundle and the expected use scenarios for the bundle. No. You should seek to use the smallest BREE (Bundle-RequiredExecutionEnvironment) possible. There's several reasons to use a BREE smaller than your prerequisites. One is just sound architecture. Things might change in the future, so you want to code your bundle based on your needs. Maybe that prerequisite will be refactored out next release. Similarly, you do not (normally) have control over your prerequisites BREEs. They might lower theirs, they might raise it ... no reason to hard code some assumption in your bundle, based on your prerequisites. Another reason for staying at a lower BREE (or at least not exposing types from a later BREE in your bundle's APIs) is to avoid compilation errors / maintenance overhead in downstream bundles. Example: If one of your API types implements java.lang.Iterable from J2SE-1.5, then this forces all dependent bundles to move to J2SE-1.5 as well -- otherwise, they don't compile any more (although the interface addition may be binary compatible). This page was last modified 05:56, 17 September 2015 by Lars Vogel. Based on work by Markus Keller, Dani Megert and Henrik Rentz-Reichert and others.